There is a lot of hype in the Paleo community about bone broth – everyone talks about it… And I think that is because it is so good for you. Bone broth is rich in the amino acids proline and glycine. And it also contains a wide variety of essential vitamins and minerals. On top of that, it boosts your immune system (remember the chicken soup that you eat when you have a cold) and it aids digestion. 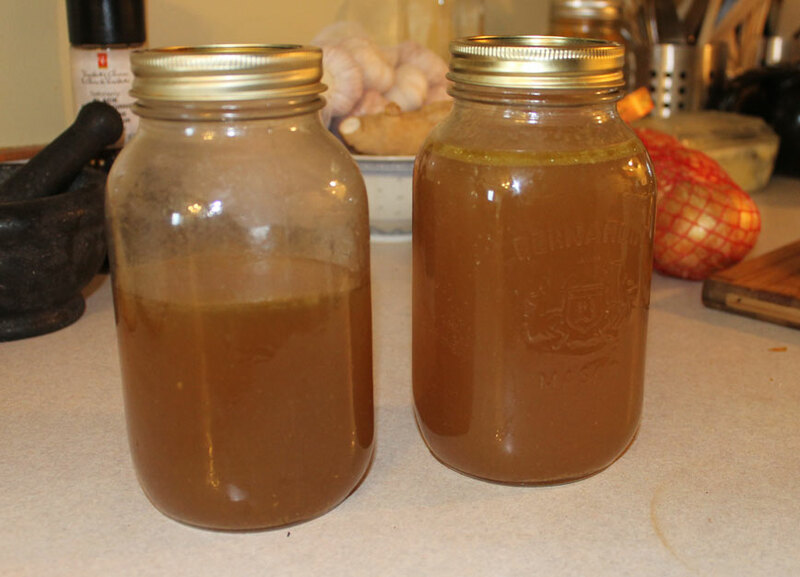 Why throw away that chicken carcass when you can use it to make a nutritious bone broth? Don’t be afraid, it is not hard to do. Simply put your chicken carcass in a large pan (I sometimes use the slow cooker) and add any leftover skin and meat, add an onion that is cut in half (no need to peel it), a roughly chopped carrot and a stick of celery that has also been roughly chopped. I usually also add a few garlic cloves. Toss in a bay leaf and some parsley stalks (why waste them? They actually contain more flavour than the parsley leaves!) and cover the whole thing with cold water. I don’t usually add salt to my broths until they are made as it concentrates down and could become over-salty. Then add a glug of apple cider vinegar or a little lemon juice. The acid in the ACV/lemon juice helps dissolve out the minerals from the bones making it even more nutritious than plain and simple bone broth. Now you need to bring it to the boil, skim off any foam/scum that forms, and turn it down to a simmer. The longer you let it simmer for the richer and more nutritious your broth will be. Anything up to 24 hours is good. And this long simmering is why I often make it in the slow cooker. I can leave it cooking on low overnight, and by the morning I have a rich, tasty bone broth that just needs straining. Taste it, season with salt if necessary and strain. So once your broth is made store in the fridge. I like to use mason jars for this. One small chicken carcass made the broth/stock in the picture above. If you want to remove the fat, it is easiest to do when the broth is cool. I rarely bother unless there is a very thick layer. If it has simmered for long enough and has extracted the maximum amount of nutrients, your broth should turn to jelly because of the gelatin you have extracted from the bones. It should last about a week in the fridge. You can also freeze the broth in the mason jars. Just don’t fill them up to the brim as it needs some room to expand as it freezes. I usually leave the lid slightly loose while freezing and then tighten it once it is solid. Your bone broth will keep for several months in the freezer. Remember to let it defrost before you need to use it, and don’t be surprised if it wont gel – freezing can sometimes make things that contain gelatin turn runny. So what can you do with all this wonderful bone broth? Use it in soups, stews, casseroles. Add it t0 stir-fries. Steam-saute vegetables in a little bone broth. Or simply drink it as a nutritious hot drink. 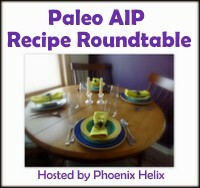 This entry was posted in Autoimmune Protocol Foods, Frugal, Recipes and tagged AIP-friendly, bone broth, bone stock, bones, carcass, chicken, frugal, gluten-free, Grain-free. Low Carb, nutritious, paleo, primal, sugar-free. Bookmark the permalink.